DuPont Corian®, a high quality solid surface material which offers superb design options and excellent performance. It can be seamlessly curved and moulded into almost any shape which gives you infinite design possibilities and is the ideal solution any project, be it in the home or commercial environments. 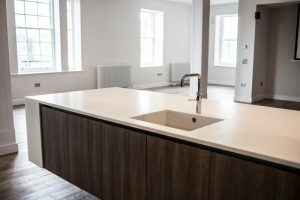 We fabricate and install DuPont Corian® in both domestic and commercial properties and locations. 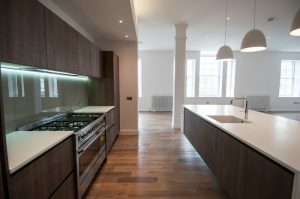 Within the home it is mainly used in the kitchen and bathroom areas as work surfaces, sinks, wall cladding and as furniture. At GM Solid Surfaces we are increasingly finding as architecture becomes so much more sophisticated now that we are being asked to fit DuPont Corian® externally, for example as cladding panels. We fit DuPont Corian® in many commercial environments – bars, restaurants, dentists and doctors surgeries, reception areas plus many more. Its material qualities mean that this surface is the top choice where hygiene, durability and limitless design potential is a requirement. DuPont Corian® is available in a wide choice of colours. We can also supply a selection of sinks and bowls which are available in a wide range of shapes, sizes and colours. These can be seamlessly integrated into your worktops eliminating the need for joints and seams. Corian is a solid, homogenous, non-porous and resistant material. It is very difficult to stain, easy to clean and is very hard wearing.